Whether you think of California as a promised land or a dead end, it’s always been a reliable source of inspiration for photographers, and some of my favorite new books explore the terrain from unexpected angles. The most substantial of these is Anthony Hernandez (SFMOMA/D.A.P. ), the catalogue, for a retrospective that continues at the newly expanded San Francisco Museum of Modern Art through January 1, 2017. Hernandez was born in Los Angeles in 1947 and has made the city and its environs his primary subject. In 1984, after years of photographing some of L.A.’s more desolate locales in stark black and white, he made a color series on Rodeo Drive that sidled up to the pretty, vacant denizens of that nouveau riche shopping strip only to back away in dismay. The satiric undertow of those images was irresistible but a bit too easy. Still, the series was a turning point: Hernandez switched to color and stopped shooting people, focusing on the human impact on the land. Photographs of the debris left behind in Angeles National Forest (shell casings, doll parts) led to an extraordinary series he called Landscapes for the Homeless – mostly wooded sites briefly colonized by people on the move. Hernandez’s scrupulously specific pictures of the mattresses, clothes, and makeshift cardboard shelters they left behind make an invisible population present, and makes their absence all the more poignant. His subsequent work took him to Rome, Oakland, and East Baltimore, but L.A.’s sprawl remained a magnet and, even as the images emptied out, their charge intensified. In an exchange with Lewis Baltz included here, Hernandez says he often photographed things “because nobody else was looking.” And if they were, they weren’t seeing as clearly as Hernandez, or with such consistently fine results. Both Curran Hatleberg’s Lost Coast (TBW) and Gregory Halpern’s ZZYZX(Mack) are more contained bodies of work, but they’re inspired by road trips, so they sprawl, meander, and feel curiously random and open ended in the contemporary style. 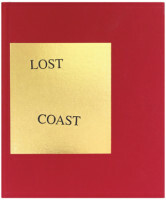 Neither book includes captions or descriptive text; Halpern’s notes only that “with few exceptions, these photographs were made in and around Los Angeles between 2008 and 2015.” Hatleberg’s pictures were made much further up the coast, in scrappy Humboldt County, near the Oregon border, over the course of six months in 2014. As a result, Lost Coast is the more immersive and descriptive of the two books; Hatleberg is hardly a photojournalist, but his curiosity drives his work and carries you along. His affinity for outsiders makes me think of Alec Soth and Mike Brodie, but Katy Grannan would seem a more obvious influence in Halpern’s case. Like hers, many of his portrait subjects appear wild and adrift, and his landscapes offer little comfort, but his trajectory – from the desert to the beach – is a hopeful one, even if the water’s dotted with rotting oranges. In a more determinedly upbeat mood, there’s the AMG 1000 Model Directory (Taschen), a two-volume boxed set of easily twice that many pictures of nearly naked guys produced during the first 20 years (1946-1966) of the L.A. physique studio known as the Athletic Model Guild. Although photographer Bob Mizer’s view of the city is both idealized and circumscribed – he shot at Malibu and in the high desert, but many of his landscapes involved papier-mâché rocks on the roof of his home-studio compound – his booming underground enterprise wouldn’t have happened anywhere else. With a steady supply of handsome Hollywood hopefuls, Mizer had no shortage of beefcake, but he was clearly obsessive, ambitious, and relentless, and the book is testimony to that – and to editor Dian Hanson’s genuine pleasure in the work. Because Mizer’s wit kept his eccentricity from going dark, the pictures’ vivaciousness almost eclipses their eroticism.